Clear all 44 jellies and reach 100000 points to complete the level. This level has medium difficulty. For this level try to play near to blockers or make special candy as you get the chance. 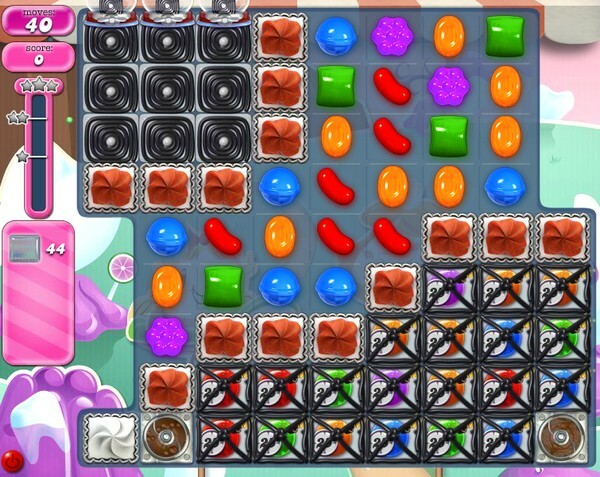 Combine special candies with each other or play near to jellies to break them all. Again with ‘medium’ nonsense! Tough as hell level. Took me about 5 days to beat. Required wrapped/wrapped combo and colour bomb/wrapped plus some luck. 2037 completed! 9 boards! Clear lower left blocker. Having a difficult time with this level .would appreciate your help.Thaanks!!!! I’m on this one forever. It is definitely not medium level. It is very hard. Wrapped combos will not clear the bombs, only one if I’m lucky. Ready to quit. I give up. This level is impossible. Goodbye King. Goodbye im leaving this game for good. Fed up with trying to clear this hard level. Six days totally wasted trying to pass this level. This level is giving more trouble than any of the previous 2036 levels! I’ve about had enough! I only have 35 moves, have tried one hundred times. Probably not going further!